Tuck’s Initiative for Women started with a symposium. After she and members of her team met with Sheryl Sandberg to celebrate the publication of “Lean In,” Elyse Allan D’79, T’84, president and CEO of GE Canada, turned to her male CFO and asked how many conversations regarding maternity leave he had with the women he supervised. Empowering women, cultivating diverse voices, and creating a more enlightened corporate culture were the underpinning themes of the two-day symposium as well as of the overarching Tuck Initiative for Women. Both were the brainchild of outgoing Women in Business (WIB) president Stephanie O’Brien T’14, outgoing WIB Board alumni chair Maureen “Mo” Gartner T’14, assistant dean Sally Jaeger, and executive director of development Erin Tunnicliffe T’97. 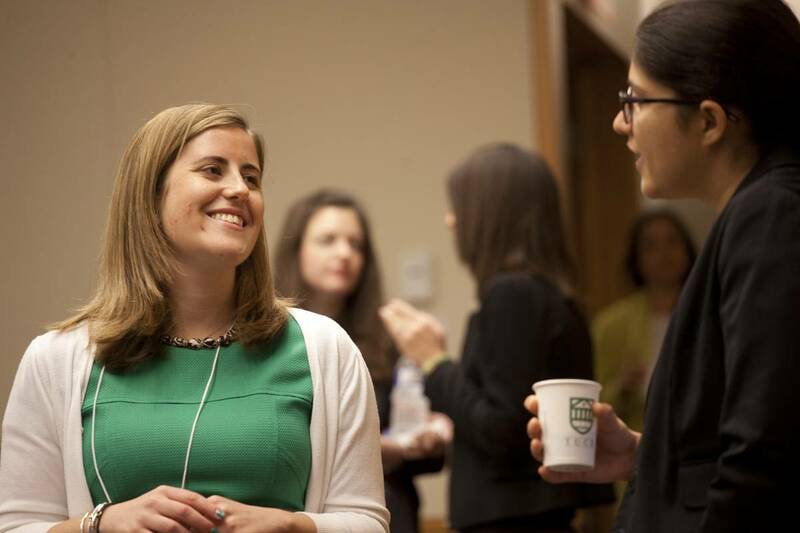 The launch of Tuck’s Initiative for Women occurred during the spring 2014 MBA Advisory Board meeting, where O’Brien and Gartner gave a presentation describing why they were seeking administrative support. So impressed were the members of the MBA Advisory Board with the initiative, in fact, that they underwrote the entire symposium, which began on Thursday, May 1. Attendees kicked off the conference with a discussion of gender in the business school context, moderated by Matthew Slaughter, associate dean for faculty and the Signal Companies’ Professor of Management. On the following day, author Sara Laschever led a professional development workshop, “Learning to Ask: Women and the Power of Negotiation” before attendees broke for lunch and the keynote address, delivered by Allan. Framing her talk around the five capability areas she and GE value most for success, both personally and professionally, Allan discussed how everyone—but women especially—could benefit from an increased focus on: external focus, clear thinking, imagination and courage, collaboration, and expertise. Buoyed by the success of this first symposium, the Initiative for Women will provide additional support to broaden the conversation about gender dynamics at Tuck, including bringing in alumnae to participate in a “Women’s Voices” speaker series, hosting a series of women’s career advice seminars, and connecting students and alumnae in small-group settings. Elizabeth Winslow, senior associate director of the MBA program at Tuck, will serve as executive director of the new initiative. As the symposium concluded, Allan urged women—and everyone—to make the most of this groundbreaking initiative by championing each other, celebrating diversity, and epitomizing the highest ideals of Tuck’s one-of-a-kind school and community.